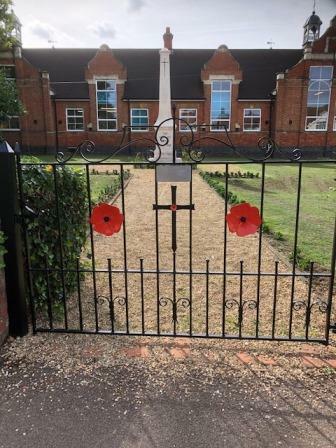 Bletchley and Fenny Stratford Town Council has recently taken on responsibility for maintenance of the War Memorial in Queensway. The Memorial was professionally cleaned by a specialist contractor in May 2018 to have it in prime condition for a commemoration of the 100th anniversary of the 1918 armistice in November 2018. The Memorial received more care and attention to both the borders and planting, and the gate was restored in late May in 2018. This work was kindly undertaken voluntarily by local Freemasons in the community. Please find details and history of the Queensway War Memorial below. If you would like to read a full report from Historic England, please click here. The War Memorial stands on the south side of Queensway (formerly Bletchley Road), outside Knowles Junior School. It comprises a tall column, square on plan, with a flared base and low pyramidal cap. The column stands on a pedestal and two-stepped base. The front face of the column is ornamented with the incised carving of a small reversed sword. The principal dedicatory inscription to the front face of the pedestal reads THE/ GLORIOUS/DEAD/ 1914 – 1918. The dates 1939 - 1945 are recorded on the pedestal foot below. 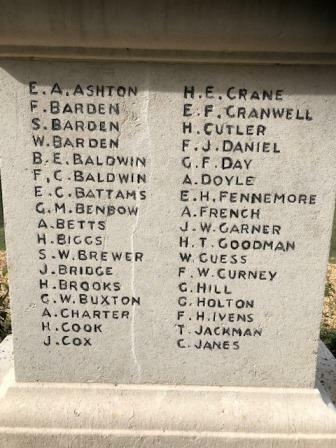 The names of the dead are carved into the right and left hand sides of the pedestal with the names of the Second Word War personnel recorded on the rear face, below the dates 1939 – 1945. The aftermath of the First World War saw the biggest single wave of public commemoration ever with tens of thousands of memorials erected across England. This was the result of both the huge impact on communities of the loss of three quarters of a million British lives, and also the official policy of not repatriating the dead which meant that the memorials provided the main focus of the grief felt at this great loss. 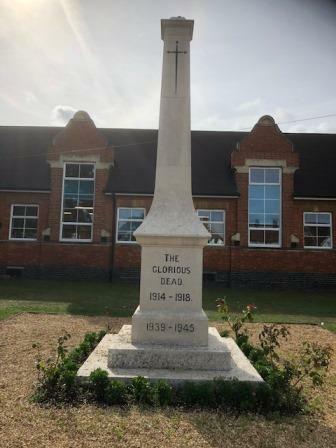 One such memorial was raised at Fenny Stratford as a permanent testament to the sacrifice made by 69 members of the local community who lost their lives in the First World War. 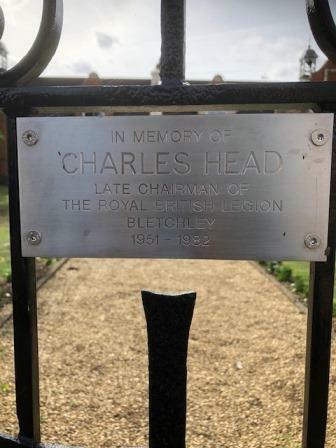 Bletchley Urban District Council agreed that each of the three Parishes within its administrative area (Central Bletchley, Old Bletchley, and Water Eaton and Simpson) should construct its own memorial. The Chairman of Bletchley Urban District Council, ST Jones, called a meeting on 13 February 1919 to discuss both a suitable memorial and the peace celebrations. A number of suggestions were made for the former including a stone memorial, an institute and a library: a sub-committee was formed to take the matter forward. The sub-committee duly considered the matter on 6 March and it was agreed to consult the Urban District Council’s surveyor, Major John Chadwick. A site was suggested on the Bletchley Road between the Council offices (at the junction of Queensway and Victoria Road) and Messrs Randall’s foundry (in Cambridge Street). At a meeting held on 11 March there was a long discussion about a scheme for a hall with public baths, which Chadwick estimated at £5,500. This figure was twice the pre-War cost and Chadwick’s figures were questioned, with some of the members thinking that the sum might fall to £3,500. The meeting was adjourned as those present felt unable to make a decision. The matter lay in abeyance until a meeting of the War and Peace Celebrations Joint Committee on 29 August, when someone present called for a cenotaph on the lines of the one erected in London. A vote was taken. Four people voted for the public baths and the balance (unspecified) voted for a monument. Sir Herbert Leon, a noted local politician and public benefactor, called a Town Meeting on 5 September to consider or reject a proposal for a memorial consisting of either a cenotaph or an obelisk. Major Chadwick was subsequently asked to prepare a design and he gave his services voluntarily. A meeting of the Committee on 3 February 1920 considered Chadwick’s design and, while granite was preferred, at c£200 Portland stone would be some £140 cheaper. It was agreed to transfer £123 from the Peace Celebrations funds. The War Memorial Committee for Old Bletchley asked for the return of £19 that it had provided for the Peace Celebrations, raised from door-to-door collections. The committee decided to refuse this application, because no detailed records had been kept concerning the precise source of the money. 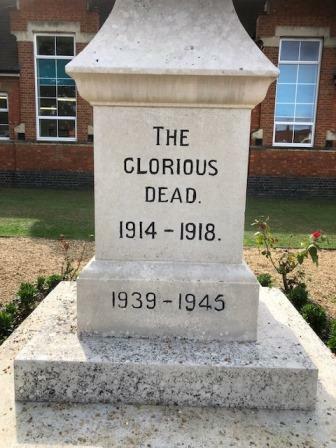 There was a slight change to the proposed location for the memorial, which was to be in front of the boys’ department of the Bletchley Road Council Schools (also designed by Major Chadwick). Construction work duly started and, in November 1920, it was reported that the substructure should be complete by the end of the year. The builder was Messrs Yirrell of Leighton Buzzard and the memorial was dedicated on 8 January 1921 by Colonel P Broome Giles. A paved path and stone wall were built at a cost of £10 6s 6d in 1922, funded from the balance in the Memorial Funds account. The work was supplemented by a footpath, chains, and gates in July 1927 costing £8 10s, using surplus money in the account together with £5 15s donated by the Women’s Section of the British Legion, which had decided to close. At a ceremony to mark the completion of the gates, the ribbon was cut by Lady Leon. 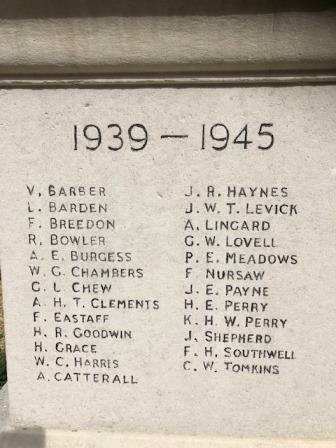 Following the Second World War, the names of 25 local servicemen who died in that conflict were added to the memorial. John Chadwick (b1865 in Petersfield, d1943) was appointed as Surveyor to the Urban District Council in 1895. New areas of Bletchley were built under his direction and he also designed the Council Offices and Bletchley Road Schools. He was granted a leave of absence to serve in the First World War, attaining the rank of Major, and returned to his role as Surveyor in 1919 until his resignation in 1935. 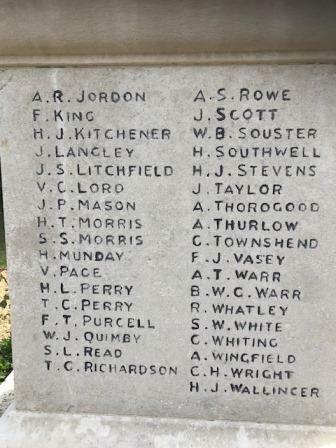 His son, Lieutenant Douglas Gordon Chadwick, died from wounds in France in 1916 and was commemorated on Old Bletchley War Memorial, which Major Chadwick is also reported to have designed.